Today TTR is pleased to present guest book reviewer Eve Lyons, a fine poet, playwright, and fiction writer living in the Boston area. Welcome, Eve! I have almost every book Naomi Nye has written. And she, along with Langston Hughes, hold a special place in my heart as the two poets who made me fall in love with poetry, because they are the first two poets with whose words I connected. And unlike Hughes, Nye was still very much alive when I was in high school, and moreover she even lived in my hometown – a hometown that couldn’t even support a real theater scene despite being one of the top ten largest cities in the country. But we had poets! It was so comforting. So I have followed her work since Different Ways to Pray and Hugging the Jukebox, and I have taken poetry workshops with her and, in full disclosure, had my own work published by her. 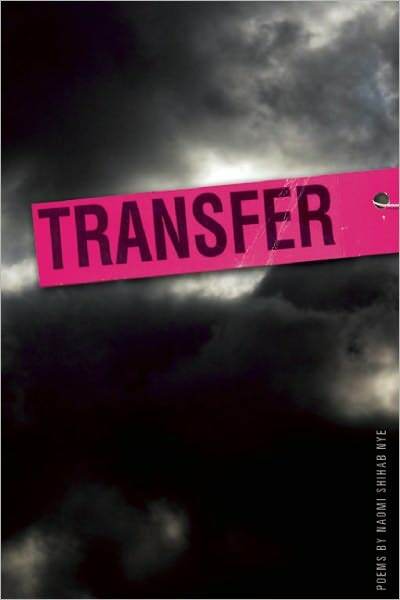 Her most recent book, Transfer is a sad and moving collection, and a beautiful homage to her father. Here is a confession though – I didn’t really process that it was an homage to her father the first time I thumbed through it, because my style of reading poetry the first time is nonlinear – I pick up the book and read the poems that call out to me, not starting on page one and working my way forward. But in preparation for writing this review, I went back and read the first half of the book straight through. Then I couldn’t stand it anymore and I began to flip around some more, until I’d checked out all the poems. The thing is, Nye kind of rewards both the linear and the nonlinear style of reading a poetry collection. The linear style was rewarded to discover that buried in the middle of this collection is a mini-collection entitled “Just call me Aziz” – eleven poems based on titles Nye found in her father’s notebook, written in her voice and his voice, sometimes both at once. These poems are exquisite and capture the ache of a people in exile, an oppressed people, living side by side with another oppressed people, who have been villainized by their own violence and by the exaggerated perception of that violence. The nonlinear approach rewards as well, because my eye was drawn to the very short poem “Lying While Birdwatching” which was light, simple, funny, and so very true. For what it’s worth, the poems I first marked when I bought the book a couple years ago were “Call to Prayer”, “Scarred, Scared, Sacred”, and “Being Back With Family Is Quite Wonderful But Terribly Exhausting” – the latter of which was part of the eleven poems referenced earlier. It’s a beautiful poem that works as a stand-alone poem any tired parent can relate to, but in the context of the heavy narrative burden Nye’s father carried around with him, it hits on a deeper level as well. On the second read-through of the poems, “The Only Democracy in the Middle East” hits me hard, as an American Jew, because of how many times that phrase has been said about my people’s state, and how quickly Nye dismantles the idea with this short, eloquent poem. I tried to get Americans to think of them. To imagine ours. And you can’t blame them, really. have enough energy to worry about. This collection is gorgeous, and reads like a love letter and a eulogy to Nye’s father at times, but with bits of everyday life interspersed, because after all, isn’t that what grief is? It’s just a part of life. A bit about Eve . . .
Eve Lyons is a poet, playwright, and fiction writer living in the Boston area. Her work has appeared in many literary magazines and anthologies, including Lilith, Hip Mama, Writers Resist, and most recent Dead Mule of Southern Literature. She works as an expressive arts therapist.